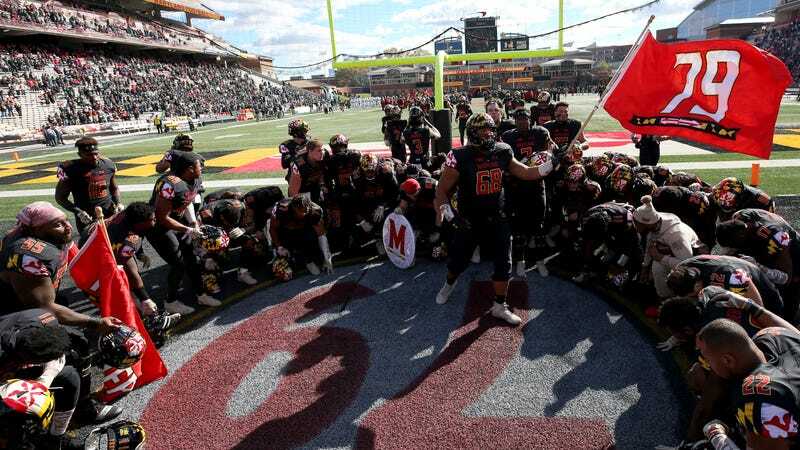 The University of Maryland has released surveillance video and other footage from the football team’s offseason workout on May 29, 2018 that resulted in the death by heat stroke of football player Jordan McNair. The surveillance videos add little to the story, and the parts of the videos that contain medical information have been redacted. But a few bodycam videos provide a bit more detail to the moments between the arrival of EMS and McNair’s departure for the hospital. Those videos come from two University of Maryland police officers—an Officer Walker and an Officer Rabold. Video and audio calls indicate the first ambulance and University of Maryland Police Officer Walker arrived on-scene at 18:03:33. They accessed the building from the ground floor of Gosset and took elevator to the athletic training room. Jordan McNair is loaded onto the first ambulance stretcher and moved outdoors. Athletic Trainers are continuing to attempt to cool with ice packs to the groin and axilla. The Head Football Athletic Trainer confirmed the hospital for transport and confirmed the need to continue cooling efforts. The paramedic confirmed the need for cooling, and informed the Head Football Athletic Trainer Washington Adventis had the “Bear Hugger” for cooling. At 18:10:57, the ACLS ambulance arrives on-scene front of Gosset. At 18:11:44, the ambulance drives from front Gosset around back to field level. The Head Football Athletic Trainer secured ice and water in an office garbage can and took to ambulance for continued cooling. The patient is transferred from the gurney of ambulance 1 to the gurney of ambulance 2. At 0:34 of the above video, while waiting for an elevator to take her to where McNair is being treated, Officer Walker says to a Maryland staffer, “I don’t know why they’re moving so slow,” in reference to the medics. Walker does clarify that McNair had previously been inside before being wheeled outside to wait for the second ambulance, but the rest of the conversation is redacted. The full videos from the investigation can be viewed here.